WASHINGTON — It’s become an annual tradition in Northwest D.C. for the past 64 years, as local volunteers put together a variety show of political comedy ripe for the nation’s capital. 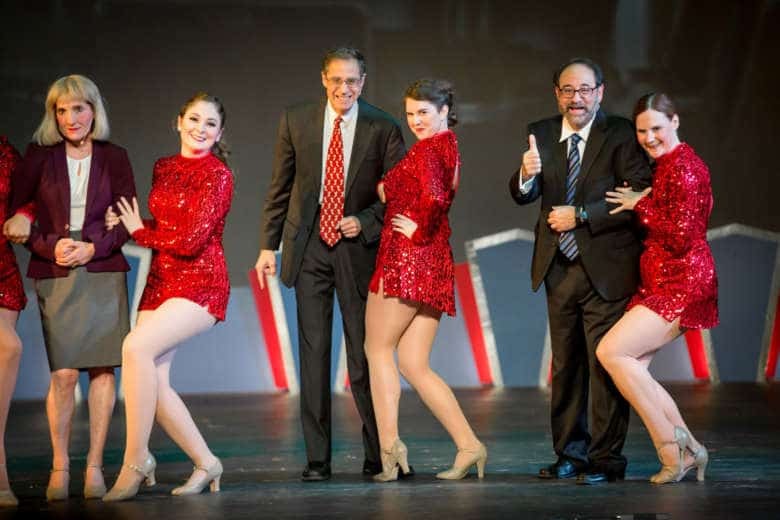 The show runs Fridays, Saturdays and Sundays in March at Woodrow Wilson High School. These sketches are written over the course of the year by local creatives. The final cast is made up of about 30 volunteers with varying day jobs. Many of these folks had creative backgrounds before entering their eventual careers. In between, you’ll see “Newsbreaks” a la “Weekend Update” segments on “SNL.” Instead of Jimmy Fallon and Tina Fey, the anchor team consists of local news figures such as WTOP’s Bruce Alan, Joan Jones, George Wallace, Shawn Anderson and Hillary Howard, as well as other outlets with NBC 4’s Doreen Gentzler, Fox-5’s Tony Perkins and Bloomberg’s Amy Morris. With so much community involvement, it’s hard to believe that it all started with just three people back in 1955, before expanding to six performers — hence the name Hexagon. This year’s charity is The Grassroot Project, which will receive 98 percent of the proceeds. The remaining 2 percent of proceeds will go to keep the nonprofit Hexagon operating.